Two weeks down since the Mobile World Congress ended for this year, but I did not get a chance to write about my experiences there. The reason was me taking some time off from work to move a little around Spain and pursuing another one of my passions i.e. world travel! I’ll write about my amazing experiences as a traveler in this beautiful country another time, but for now I’d like to talk about the one week at MWC and what it meant for me as a mobile developer. 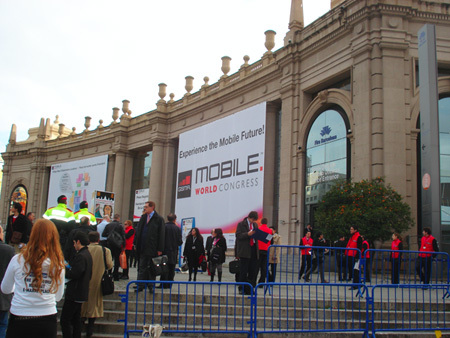 The Mobile World Congress held in Barcelona, Spain is one of the biggest events in the mobile world. Anyone related to the field of wireless, be it mobile developers, technology leaders, OEMS, carriers, aggregators, mobile tools providers etc, all descend on to this little world in Fira Barcelona to discuss the next BIG thing in Wireless. I had the opportunity to be there this year, and it was memorable for several reasons. I got to meet and talk to some really bright people in the field of mobiles, met some old colleagues, discussed some business opportunities, witnessed the launch of many new platforms and devices, did a presentation at the Symbian Foundation booth, participated in discussions on the last day of the event with WIP JAM, and finally attended the Lite Days event organized by the Spanish Mobile Adobe User Group. As a developer, my major concern was to look out for technologies during the event that offered great tools & support, at the same time would help me reach out to as many consumers as possible. Well, there was no magical booth that scored on all the three points but I came across some good platforms which I may look into in the coming weeks..with most of them being widget based. Opera Widget SDK definitely showed some great potential. 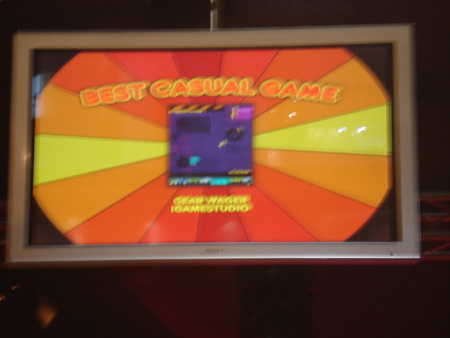 I saw some great working examples on handsets including a Flash Lite example. The Opera Mobile 9.5 has support for Flash Lite 3.1. Yahoo was promoting it’s Blueprint 1.1 platform with a lot of demos and workshops. Some cool stuff here too. Another widget SDK that showed great potential was Streamezzo. Apparently their framework solves a lot of developer issues, specifically related to porting on different mobile platforms. It is supposedly an intelligent framework that automatically fits it’s self well on any screen. I was quite impressed with what they showed me and would definitely look into their SDK. 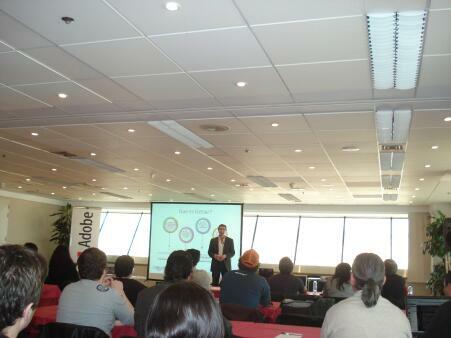 Adobe too lived up to its commitment of last year in focusing on the Mobiles area. 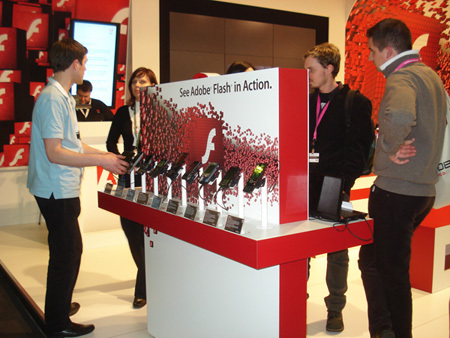 This time in MWC, Adobe made several announcements which we will find extremely exciting and motivating to take it forward, and look at it as a potential platform for 2009. AppStores also seemed to be an upcoming trend with Nokia announcing their OVI Store, allowing developers to publish and sell their content through Nokia’s global application market. Got to see some great devices like the ones from DoCoMo, LG, Nokia and Android handsets. 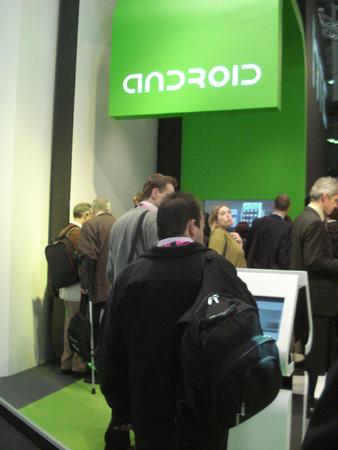 Apparently Samsung was to display a new Android phone during the MWC, but it turned out to be a rumor. That kind of sums up my Mobile Week during the Mobile World Congress. I think the conference was great and much bigger in scale when compared to the conferences I’ve attended so far. It definitely deserves another visit next year. 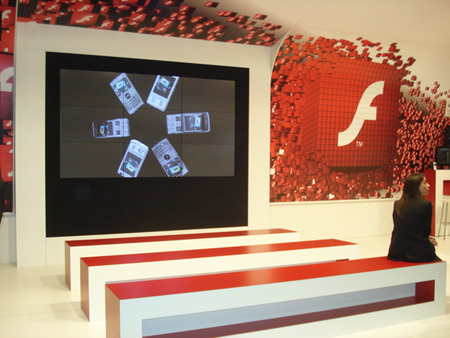 yipee….I love you Forum Nokia and I love you Adobe. This coming together of giants may just do sth wonderful to people like me.